Wilbur Ross also criticized air traffic controllers who have called out sick. As the partial government shutdown stretches into day 34 and some of the 800,000 federal workers are set to miss their second paychecks starting Friday, Commerce Secretary Wilbur Ross is downplaying the effects on government employees and the overall economy. Asked in an interview with CNBC Thursday about workers who have been seen lining up at food banks and homeless shelters, Ross, a multi-millionaire, appeared to advise them to take on new debt. "Well, I know they are and I don't really quite understand why,” Ross said. “Because as I mentioned before, they – the obligations that they would undertake, say, borrowing from a bank or a credit union, are in effect federally guaranteed." "So the 30 days of pay that some people will be out, there's no real reason why they shouldn't be able to get a loan against it," Ross added. 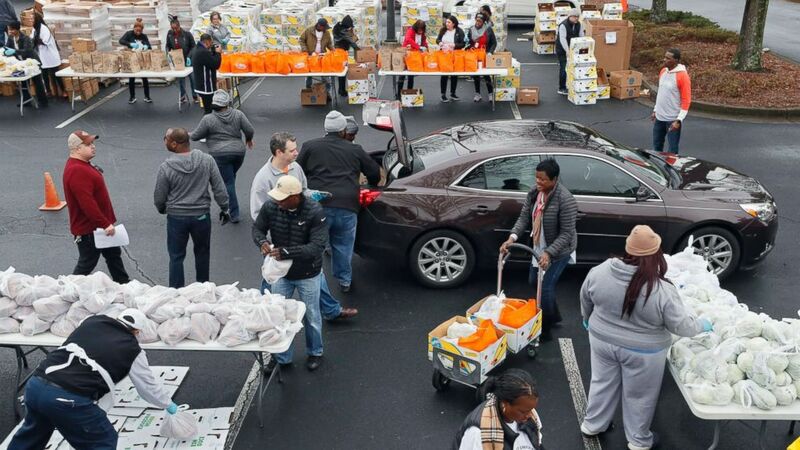 (Bob Andres/Atlanta Journal-Constitution via AP) Employees from the TSA and Customs and Border Protection and their families waited in line for about an hour for groceries from the Atlanta Community Food Bank and Antioch Baptist Church, Jan. 18, 2019, in Hapeville, Ga.
Democratic lawmakers immediately pounced on the comments to frame the administration as tone-deaf, as multiple polls continue to show Americans largely blame President Trump and congressional Republicans for the record-long shutdown. Wilbur Ross doesn’t understand why federal government workers are going to food banks. But I have a sneaking suspicion he understands how many millions he saved under the Trump Tax cuts. "Anybody who’s at the top of the food chain is totally tone-deaf,' Democratic Sen. Joe Manchin told reporters Thursday. "If that’s where they are, they’ve been out of touch with reality for that long, because I can tell you, I’ve been all over West Virginia. People are hurting." Senate Minority Leader Sen. Chuck Schumer admonished Ross from the Senate floor Thursday morning. "Those comments are appalling, and reveal the administration’s callous indifference towards the federal workers it’s treating as pawns," Schumer said. "Secretary Ross’ comments are the 21st century equivalent of 'let them eat cake.'" Even Republicans swiftly panned Ross' comments. "I can't relate to the Secretary's comments because I have been hearing directly from Alaskans and non-Alaskans," GOP Sen. Lisa Murkowski of Alaska told reporters Thursday. "I have been hearing them tell me what it's like to be a proud member of a Coast Guard family ... that is proud to serve. And to know that they have to go the food bank in order to get necessary food to tide them over until the next time they get paid ... I hear very directly." "They have Wilbur Ross saying he 'doesn't understand why' when he was asked about people going to food lines and pantries," House Speaker Nancy Pelosi said in remarks at her daily news conference. "He doesn't understand why they have to do that. Is this a ‘let them eat cake’ kind of attitude or ‘call your father for money?’"
Trump appeared to misinterpret Pelosi's comments as he later tweeted attacking Pelosi, suggesting she was referring to the border wall and not the comments by Ross. In the same interview, Ross also downplayed the effect on the broader economy from the estimated 800,000 workers not receiving pay. (AFP/Getty Images, FILE) Lara Trump speaks during a campaign rally at the Toyota Center in Houston, Texas, Oct. 22, 2018. 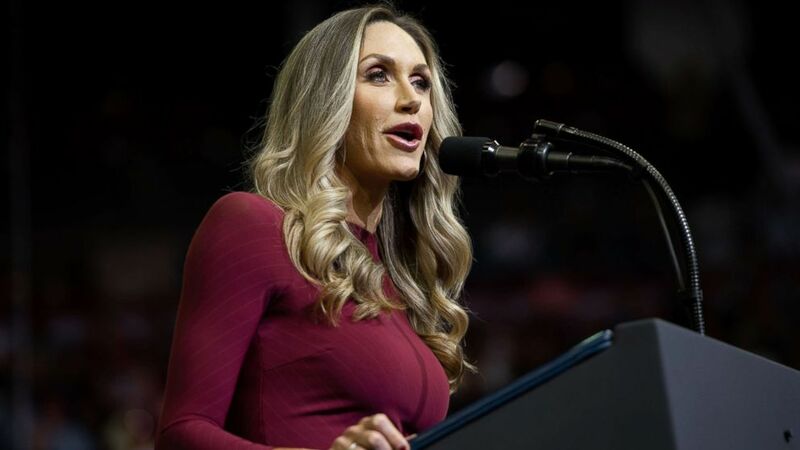 The comments come one day after President Donald Trump's daughter-in-law and campaign adviser, Lara Trump, faced criticism for her own comments regarding government workers. The president himself was criticized early on in the shutdown when he was similarly pressed on whether he could sympathize with workers who have to go without pay as he continued to demand Congress fund his proposed wall along the U.S.-Mexico border. "I can relate," Trump said. "I'm sure the people that are on the receiving end will make adjustments. They always do. People understand what's going on. Many of those people that won't be receiving a paycheck, many of those people agree 100 percent with what I'm doing."